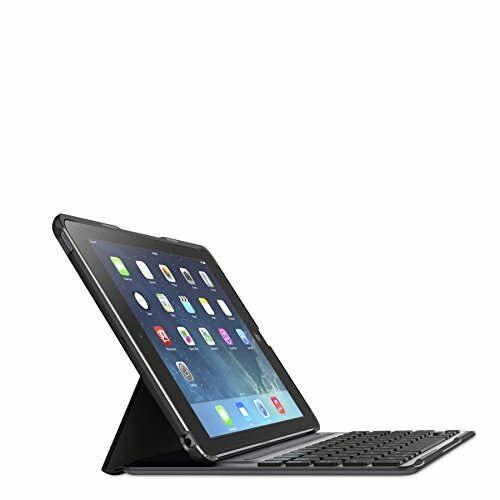 When it was first launched in 2013, the Belkin QODE iPad Air Keyboard Case was one of the more anticipated iPad Air Keyboard Cases. They are available in Black and White and being crafted from aircraft-grade aluminum they are excellent for sturdiness and durability. Besides the durability this aluminum offers, it’s also extremely thin and light for the strength. It’s 0.75 inches thick which is very good. The well-engineered fold-out stand also offers adequate support for utilizing the keyboard. Belkin utilizes its TruType keys again which gives similar response to that of a real laptop keyboard. It also houses a 280mAh battery which is good for 1,900 hours of active use and 4,300 hours of standby time. Specifically, it’s good for 264 hours of actual types, and a single type is probably a millisecond. When the battery eventually runs out, just recharge it, no need for juggling AAA batteries. Belkin is nice enough to include a USB to Micro USB charging cable for the task. The chiclet keys are also excellent to type on. There are some neodymium magnets in the case that are used to secure your iPad Air when it is encased and propped up on the stand. There are several angles you can position your tablet at and each one is secure. When you do close the case over your iPad, there’s also magnets in play that will put your screen to sleep. It will waken it back up upon opening it. When you’re not using the QODE as a keyboard case and stand, you can fold it around on itself and use it as a traditional tablet, as pictured above. When encased, you’ll also still have access to all of the vital ports and buttons. There’s also room for the speakers at the bottom to properly output sound as well. This is definitely one of the more premium keyboard cases available, and the price definitely reflects as much. If you’re looking for a high quality accessory to match the high quality of the iPad Air, look no further. Check out our other recommendations for the Cases With Keyboard for the iPad Air.